Sometimes known as ‘the fairy of the woods’ due to its ability to appear and subsequently disappear, melting into the woods in front of you, the beautiful little roe deer, Capreolus capreolus, is a joy to hunt. A true gem of a British native; the roe buck should be on every hunter’s wish-list. Please contact us to arrange your hunt today. Athina Sporting is pleased to offer the opportunity for you to stalk these little beauties in the stunning Scottish scenery around New Galloway, Scotland. With representative and medal heads present on our grounds, the stalking takes place across challenging, yet beautiful terrain. 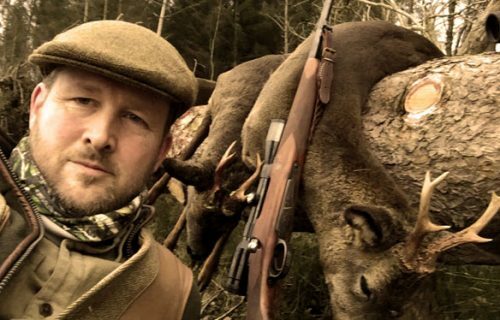 Scotland proves itself a formidable trial for any experienced hunter, providing you with a hunting achievement you’ll be proud of for years to come. We have availability for stalking for roe bucks over weekends – Friday through to Sunday, with a shooting test conducted upon arrival, followed by the 3 days of stalking. Accommodation, airport transfers and firearms permits can be arranged upon request for our foreign visitors. Trophy preparation can also be arranged if required. Please contact us now to discuss your booking! For roe bucks, the Scottish season runs from 1st April to the 20th October. Roe deer rut in late July and early August, during which time the bucks are far less elusive than usual and will come to a simulated doe mating call. This can make for some really exciting hunting with occasionally more than one buck crashing through the undergrowth in a hurry to be the first to reach the doe! Bucks tend to lie up in cover after the rut, so mid to late August and early September can be unproductive, though we often have good late season success as the cover recedes in October.